U.S. Sen. Thom Tillis (R-NC) this week told the U.S. State Department that its approach to return American children abducted abroad back to the United States isn’t working and more needs to be done. “As United States senators, we cannot simply sit by and watch the State Department continue to issue ineffective demarches while countries continue to shelter those who abduct our citizen-children. 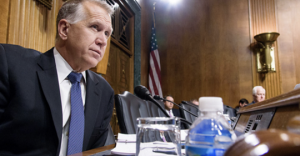 We are committed to ensuring the return of every American child abducted abroad and we will not stop working on their behalf,” Sen. Tillis wrote in a bipartisan Jan. 2 letter sent to State Department Secretary Mike Pompeo. U.S. Sen. Dianne Feinstein (D-CA) also signed the letter. Each year, several hundred American children are abducted by one parent and taken to a foreign country, according to a statement from Sen. Tillis’ office, which added that such abductions may negatively impact a child’s mental, physical and emotional health and well-being. Congress in 2014 approved the Sean and David Goldman International Child Abduction Prevention and Return Act, which provided the State Department with tools to compel foreign governments to return abducted American children back home, according to the senator’s statement. Such tools include official public censures and withdrawing development assistance. Nevertheless, since the legislation became law, the State Department has continued to use demarches — or diplomatic communications — as its sole means of attempting to secure a child’s return, according to the senator’s statement. “Unfortunately, a comprehensive review of past annual reports shows that the State Department rarely, if ever, goes beyond issuing a demarche,” the senators wrote to Pompeo. And demarches aren’t effective, according to the senators’ letter, which noted that some countries, like Japan, have received several demarches, “but no additional, formal action was taken to address the problem of parental child abduction to Japan,” which continually harbors abducted American children. In fact, both a 2018 State Department annual report and action report show that the department still isn’t using all of the tools it has at its disposal to rectify the situation, they pointed out. The senators urged the Department of State to utilize the tools and resources provided by law to bring home abducted American children. “We hope you recognize the seriousness of the issue and will make it one of your top priorities,” according to their letter. A senior U.S. official called on Tokyo to give American parents “direct, in-person contact” with their children living in Japan during custody battles with Japanese parents under a child abduction treaty. Deputy Assistant Secretary of State Karen Christensen called for such one-on-one meetings in referring to the Hague Convention on the Civil Aspects of International Child Abduction, which stipulates what member nations should do when mothers or fathers take away their offspring without the consent of their spouses. “We believe that the Japanese central authority really does take its responsibilities in the Hague Convention very seriously,” Christensen said in a recent interview with The Asahi Shimbun in Tokyo. According to Washington, more than 30 Americans have requested meetings with their children living in Japan since Tokyo joined the Hague Convention in 2014. Although some of the U.S. parents have talked to their children in Japan through video conferences or met them in the presence of observers, no in-person, unmonitored contact has been provided so far. According to the Japanese Foreign Ministry, Japanese parents concerned about the risks of unmonitored meetings with their children have requested that such meetings be done through video conferences or under supervision. “We will continue our proper support based on laws to realizing person-to-person contact,” a Foreign Ministry official said. American Jeffrey Morehouse has no idea where his son lives, knowing only that the 10-year-old’s address is somewhere in Toyama Prefecture. His last contact with the boy was when his divorced Japanese wife lived in the United States. He lost all contact after she and her son abruptly moved to Japan. But Morehouse, who lives in Seattle, is finally taking a big step toward getting in touch with his son again, and perhaps bringing the child back to the United States. The Hague Convention on the Civil Aspects of International Child Abduction took effect for Japan on April 1, giving parents overseas, like Morehouse, and in Japan a legal means to visit their children. The so-called Hague Abduction Convention governs cross-border child custody disputes resulting from broken marriages. Under the treaty, if a marriage fails and the parents start living in separate countries, the decision on who receives parental rights to raise children under 16 falls under the jurisdiction of the country where the family lived with the child before the breakup. Before Japan signed the treaty in January, a number of high-profile cases surfaced about the plight of overseas parents who had no legal way of even contacting their children taken to Japan by their former spouses. However, Japanese parents are also expressing hopes that the treaty will help them be reunited with their children who live overseas. A Japanese woman living in Chiba Prefecture last month wrote a letter to the parents of her ex-husband, who are currently raising her 14-year-old daughter in the United States. “I have the right to meet with my daughter,” the 34-year-old woman wrote. She later received an e-mail instructing her to never again try to contact her daughter. The woman was married to an American who worked at a U.S. military base in Kyushu. After they divorced, the ex-husband returned to the United States with their 8-month-old child in 2001 without the mother’s consent and asked his parents to raise the girl. The mother visited the home of her former husband’s parents in the United States two years later, but she was allowed to meet her daughter only three times. Five years ago, the ex-husband’s family refused to let her to see the child. The woman said she expects the Hague Abduction Convention to help her in the battle against her ex-husband and his parents. “I hope the Japanese government will negotiate (with U.S. authorities) as equals,” said the mother. She plans to use the Foreign Ministry to repeat her demands that her ex-husband’s parents allow her to visit her daughter. Although cases involving children “abducted” before April 1 will be exempt from the convention, parents can still call for governmental assistance in setting up meetings with their children. A Canadian man moved to Japan in 2011 to see his three daughters. His ex-wife had returned to Japan with the children and had rejected all of his requests to visit the girls. The Canadian said he met his children three times last year without prior appointments, and that he expects the convention to make it easier for him to visit his daughters. The U.S. State Department said it received 24 applications on March 31 from divorced parents calling for meetings with their children overseas. A number of parents, including Morehouse, visited the State Department that day to request measures to set up visits with their children in Japan. According to the State Department, 58 cases concerning 80 children unfairly taken from the United States to Japan have yet to be settled, the third highest figure after Mexico and India. A representative of a group of those visiting parents said meetings with the children will be the first step in getting the children returned. Paul Toland, a co-founder of Bring Abducted Children Home, a U.S. nonprofit organization calling for the return of children taken to Japan, said he wants the Japanese government to quickly take measures under the spirit of the Hague Abduction Convention. Toland, himself, on March 31 called on the State Department to work with the Japanese government to set up a meeting with his 11-year-old daughter in Japan. Beth Payne, director of the Office of Children’s Issues in the State Department, promised that the U.S. government will continue efforts to settle cases reported before April 1 by negotiating with Japan’s Foreign Ministry. The U.S. Congress is currently discussing legislation to enable the president to impose sanctions on nations that fail to take adequate measures to resolve the child abduction problem. The House of Representatives has already passed the bill. One issue of concern among Japanese parents is how courts will weigh domestic violence in deciding if their children should be returned to the nation where the family resided before the divorce or separation. Under the convention, Japan’s Foreign Ministry will help foreign parents find arbitration organizations for their demands that their children in Japan be returned to them. If the Japanese parents refuse the demands, the Tokyo or Osaka family courts will decide whether to issue orders for the children to be sent to the country where the family originally lived. If the courts recognize the existence of serious domestic violence, the Japanese parents will be allowed to refuse to return their sons and daughters to their former foreign partners. The Hague convention will also cover cases in which both parents are Japanese and one of them takes the child overseas. Regardless of the parents’ nationalities, cases involving a divorced husband or wife taking a child elsewhere in Japan will not be subject to the treaty. Under Japan’s Civil Law, parental rights are granted to one parent after they split. Although a divorced couple can discuss visitation rights at the time of the divorce settlement, the decision is not legally binding. In many cases, the parents take their children elsewhere in Japan without the consent of their former partners. Lawmakers from both the ruling and opposition parties are currently discussing legislation to address such domestic cases. A group of U.S. fathers urged the Japanese government Monday to comply with a convention for settling cross-border child custody disputes and help them and other American parents reunite with their children living in Japan. The fathers and their supporters, including a veteran congressman, handed a petition to a minister of the Japanese Embassy in Washington, a day before Japan’s implementation of the Hague Convention on the Civil Aspects of International Child Abduction. They were among some 20 people who marched through the U.S. capital holding placards with their children’s pictures and met with a relevant U.S. government official earlier in the day to increase awareness of child abduction to Japan. The group Bring Abducted Children Home organized the events. “But remember this. It’s just the beginning. The ultimate resolution of these cases has not yet been attained,” Navy employee Toland, 46, said. Toland said he has not seen his daughter for almost 11 years since his wife took their then 9-month-old baby to Japan before divorce proceedings had concluded and custody determined. His former wife and her mother rebuffed his every attempt to see his daughter, he said. Although he has been the sole living parent since the former wife’s death several years ago, he has no rights to see his daughter. Tokyo became the 91st signatory of the 1980 Hague Convention on the Civil Aspects of International Child Abduction, which sets out the rules and procedures for the prompt return to the country of habitual residence of children under 16 taken or retained by one parent, if requested by the other parent. The Hague pact is not retroactive, only dealing with cases occurring after its entry into force. But it can provide assistance to parents seeking visitations, regardless of when they were separated from children. Christopher Smith, a House of Representative member, joined the people in making the calls on the Japanese government. “Parents here today whose children were abducted prior to ratification cannot be left behind again,” said Smith, who heads the House subcommittee on global human rights and international organizations. The fathers and the supporters, including attorneys, asked the U.S. State Department to help realize reunions with their children in a meeting with Beth Payne, director of the department’s Office of Children’s Issues. The department received 28 applications, involving some 40 children, from the group on Monday. The office has been working on 58 other cases involving around 80 children as of February 2014, according to a department official. While the department’s spokeswoman Marie Harf described Japan’s participation in the Hague Convention as “a positive change,” many parents who took part in Monday’s events indicated they have little faith that the Japanese government would help them retrieve their children. They also said they are worried that cases would be remanded to local family courts, which lack expertise on the convention and have traditionally given custody to mothers. Nor does Japan have reciprocal custody agreement with the United States. The group’s attorney Stephen Cullen mentioned that 200 more applications will be submitted within the year. Copyright 2014 Kyodo News International. WASHINGTON – A State Department official on Thursday called for the return to American parents of all children taken to Japan without their consent by their former Japanese partners after failed international marriages. “We will not be satisfied until all those children are home where they belong,” Susan Jacobs, special adviser for children’s issues at the department, said in a hearing of the Senate Committee on Foreign Relations. Although Japan is set to join the Hague Convention on the Civil Aspects of International Child Abduction in April, which mandates the return in principle of children taken away from their countries of habitual residence, the pact will not be applied to cases that occurred before Japan becomes a party. The United States and numerous other countries have repeatedly urged Japan to sign the treaty. The government plans to resubmit in mid-March a set of bills to the Diet necessary for Japan to join the international treaty on settling cross-border child custody disputes. Jacobs thus sought further action by Tokyo so as to ensure the return of children taken away from their American parents and moved to Japan before the treaty takes effect in Japan. During the hearing, Jacobs revealed there are 80 such children whose custody is requested by their American parents. “We have not forgotten cases that still exist,” Jacobs said. According to United to End Genocide, a U.S. based anti-genocide organization, Dr. Kurt Campbell, a former high profile State Department official, is now involved in commercial efforts in Burma that may further encourage human rights abuses in that country. During his years at the State Department Dr.Campbell chaired at least half a dozen meetings in Washington with left-behind parents and other left-behind family members with existing cases involving abducted children in Japan. Participants traveled from all parts of the country at their own expense to attend the meetings, many having to spend significant funds to do so. Each of these meetings, which were specific to existing child abduction cases in Japan, generally included about three dozen or more left-behind parents and family members, and at least one to two dozen officials from the State Department and other federal agencies. The meetings were abruptly terminated by the State Department after July of 2011. No significant progress was made on existing cases by the State Department and the State Department failed to secure the return of any abducted U.S. citizen children despite there being long standing criminal charges against many of the abductors holding the children in Japan. Kurt Campbell has been invested in lifting sanctions in Burma, despite ongoing human rights abuses. AFP/Getty ImagesFormer U.S. Official Encourages Human Rights Abuses to ContinueDespite opposition from the U.S. Campaign for Burma (USCB), Kurt Campbell, former Assistant Secretary of State for East Asian and Pacific Affairs, strongly influenced the Obama administration to lift sanctions on Burma in 2012 that were originally imposed more than two decades ago. The economic sanctions were enacted in September 1988 after the military regime committed human rights violations when they killed thousands during a series of peaceful protests. While the Burmese Army, blamed for the systematic murder and displacement of innocent men, women, and children, continues to carry out crimes against humanity in the Kachin State, Kurt Campbell, in conjunction with his new consulting firm, the Asia Group, will lead the ACO Investment Group (ACO) in order to secure a contract to upgrade and modernize the Yangon International Airport in Burma. The ACO will work closely with Tin Naing Tun, a retired Brigadier General of the Myanmar Army and head of the Department of Civil Aviation (DCA). Other consortium members of ACO include Boeing Professional Services, Burns & McDonnell Engineering, Fentress Architects, MITRE Corporation, and Union Consulting. Campbell plans on leading a trip to Burma early next month to pitch the ACO bid. According to the DCA, seven pre-qualified international firms are competing for the tendering of airport construction as well. The Director General of DCA claims that the new airport, Hanthawaddy International Airport, is necessary because the Yangon International Airport cannot accommodate for the rising number of travelers to the country. Arrivals to Burma are expected to surge around 3 million in 2012—a 22% increase on last year that places it above its 2.7 million threshold. Potential plans state that the Hanthawaddy International airport, located in the central Bago region, will occupy a site nine times larger than its original and will have the capacity to hold 5.5 million passengers. As one of the key architects of the Obama administration’s Asia “pivot,” Campbell doesn’t waste time transitioning from a legislator to a consultant. After finishing his tenure in public office in February 2013, he announced a few days later that his former deputy assistant secretary, Nirav Patel, would be the chief operating officer of his newly established advisory and investment network, the Asia Group. The Asia Group focuses on bringing U.S. markets into Asian markets and vice versa. Revolving door politics refer to the movement of high-level employees from public to private sector jobs. Therefore, there is a “revolving door” between the two sectors as many legislators become consultants for the industries they once regulated. Consequently, conflicts of interest cloud the reasoning of such leaders to practice unbiased decision making. Because Burma has an extended and complicated history of human rights abuses implemented by a brutal military regime, any error of judgment could have irreversible effects on the already unstable country. Children’s Rights Council of Japan and the case of Walter Benda, co-founder of CRC of Japan, are both discussed in this Christian Science Monitor article. Tokyo lawmakers unanimously approve Hague convention to settle child custody in broken international marriages. But Japanese domestic laws and legal loopholes still need to change, say scholars. Walter Benda had no inkling of what was to happen after he and his Japanese wife and their two small daughters moved from Minnesota to Tokyo in 1992. Three years later, Mr. Benda returned home from his job at a trading company one evening to find his wife and children gone. For the next three-and-a half-years he had no idea of their whereabouts. He did not know it then, but his wife had taken their daughters, then aged 6 and 4, effectively ending their 13-year-marriage and Benda’s relationship with his children. Benda is one of hundreds of foreign spouses of Japanese citizens who — after a marriage breaks down — are denied all access to their children. But now after years of pressure from “left-behind” parents, human rights activists, and several governments, Japan’s parliament on Wednesday unanimously approved a bill paving the way to join the 1980 Hague convention on international child abductions. That brings Japan in line with 89 other signatories. With the unanimous agreement, Japan is expected to become a signatory by the end of March 2014. RECOMMENDED: Think you know Japan? Take our quiz to find out. Under the treaty, children under 16 who are taken away by one parent after a failed marriage must be returned to the country in which they normally live, if action is requested by the other parent. It also protects the access rights of both parents. During his search for his family, Benda received no help from the Japanese police and authorities. He took his case all the way to the Japanese Supreme Court, without success. Unable to find a new sponsor for his visa, he was forced to return empty-handed to the US, where a federal grand jury indicted his wife, in absentia, on charges of international parental abduction. “Even though US law enforcement authorities have sought the return of my ex-wife to face the international parental kidnapping charge in the US, the Japanese police authorities refuse to cooperate because Japan does not consider parental kidnapping a crime covered under the extradition treaty it has with the US,” he said. Legal experts welcomed Wednesday’s decision, but said the treaty would have little effect unless it is accompanied by changes in Japan’s domestic law. Courts in Japan routinely favor the Japanese parent – usually the mother – in custody cases involving international marriages. “I am concerned that Japan won’t implement the convention at face value,” says Takao Tanase, a law professor at Chuo University in Tokyo. Mr. Tanase points to numerous loopholes in Japanese family law that could be cited to prevent the return of children to their original country of residence, including the suspicion – without any burden of proof – that the child could be exposed to harm or that the mother’s welfare could be affected. The number of foreign parents who are denied access to their children in Japan has increased along with a rise in the number of international marriages to around 40,000, according to Mr. Mayama. Inevitably, the trend has resulted in more divorces: Almost 18,000 Japanese and international couples divorced in 2011, according to government statistics. The US, which is pursuing at least 100 recognized abduction cases involving its nationals, has worked alongside Canada and the UK in pressuring Japan, the only nonsignatory among the G8 nations, to fall into line. In February prime minister Shinzo Abe told President Obama that Japan was moving toward ratification during their summit in Washington. The momentum for change grew in 2009 when Christopher Savoie, a US citizen, was arrested in Japan after trying to take back his children as they walked to school. Although Mr. Savoie had been granted full custody by a US court, his ex-wife took their children from their home in Tennessee back to her native Japan. Savoie’s case and others have been taken up by the Children’s Rights Council Japan [www.crcjapan.com], a nonprofit organization launched in 1996 to offer support and resources to affected parents. The council has submitted a proposal to the Japan’s justice ministry and the US State Department calling for a humanitarian access program that would grant left-behind parents regular and meaningful contact with their children. In 1998, a private investigator located Benda’s daughters, who are now in their 20s. He has seen them only twice since they were taken and for only brief periods on the street. “But they have always resisted my efforts to communicate and I have been unable to speak with them,” he said. He agrees with skeptics that Japan’s belated about-turn will do little to help him and countless other foreign parents. “While it does reflect the fact that the Japanese government is finally recognizing that there is a problem, I am doubtful it will have any immediate, noticeable effect on cases such as mine,” he said. This is an excellent link for statistics and reports concerning U.S. State Department international child abduction cases, including Japan, for 2010-2012. Also useful information on relevant U.S. laws as well as child abduction related forms and documents. Imagine getting a phone call stating that your children have been kidnapped. Your spouse has taken your kids to Japan, using the country’s laws to maintain custody. Every day becomes an exhausting task of contacting government officials to help, but little is accomplished. This scenario is very real to Patrick McPike and the parents of nearly 400 abducted U.S. children living in Japan. Including Japanese children, an estimated 10,000 have been abducted by parents within Japan. Japan has never returned any of them. McPike traveled with his family to Japan to complete an assignment for his company. His marriage strained and his wife did the unthinkable. McPike’s wife cut him off from communication with his two sons, Kai and Koh. The children became victims of Japanese law, which treats child abduction as a custody dispute rather than a felony crime. His wife is living in Japan, but could not be reached or found for comment. Japan’s view of child abduction is different from the rest of the world. They are not a member of The Hague Convention – a treaty designed to return internationally abducted children to their home nations – and their courts favor one parent having sole custody. In 90 percent of cases, the rights go to the mother. Japan is revising laws to open the possibility ratifying The Hague, but these changes may not be a total acceptance of The Hague in its current form. “If we look at the domestic laws submitted by the government in order to execute the Convention, changes have been made with current Japanese public opinion and family court practices in mind, and it is questionable whether the intent of the Hague Convention has been incorporated,” said Takao Tanase, a professor who specializes in Japanese law. During a U.S. Department of State briefing on U.S. child abductions to Japan, Assistant Secretary of State Kurt Campbell spoke about persuading Japan to join The Hague. “The President also very strongly affirmed the Japanese decision to enter into The Hague Convention,” Campbell said. “He asked that these steps be taken clearly and that the necessary implementing legislation would be addressed. “This is a human tragedy, that unless you get to experience and get to know these brave parents, it’s just impossible to imagine,” Campbell said. Getting Japan to join The Hague would be helpful, but McPike says it will not be enough, by itself, to bring back all the missing children. There have also been concerns about the lack of action from the U.S. per policy, the U.S. Department of State has not formally requested from Japan the return of any abducted U.S. children. Susan Jacobs, a special adviser for children’s issues for the U.S. Department of State, said that individual cases are raised with the permission of parents and the parents are updated on these discussions. However, most parents say they have not been told of their personal cases being discussed with Japanese government officials. Ironically, Japan refuses to return U.S. children but they want their own citizens who are abducted to be returned. From 1978-1981, about 16 Japanese teenagers were abducted by North Korea. Five of those children were returned and about six have died. The others are still missing. Japan has come to the U.S. and the U.N. asking for help to get North Korea to return these children. U.S. Secretary of State Hillary Clinton and President Barack Obama have met with Japanese families and assured they would provide help. Yet they have not met with any U.S. parents about their children being abducted to Japan, giving the appearance that they are more concerned with helping Japan. Parents also question efforts by the U.S. Department of State because of the Mary Lake case. In 2005, William Lake’s daughter was abducted by his ex-wife and taken to Japan. No one in the Lake family was Japanese, but William’s ex-wife knew of Japan’s custody laws. On August 24, 2011, Mary Lake went to the U.S. Consulate in Japan and spoke with an official who told her to return home to her abductor since she did not have the money for a plane ticket to the states. Pressure was put on the U.S. Consulate and they aided Mary Lake’s effort to go home to her father the second time. The return of Mary Lake gave parents of abducted children a small glimmer of hope for their own cases. For McPike and others like Jeffrey Morehouse and Randy Collins, getting their children back has become a daily job. Morehouse and Collins serve as regional directors for Bring Abducted Children Home (BACHome), an organization established in 2010 to raise awareness of the missing U.S. citizen children kidnapped to in Japan. Both men testified before the California State Senate Judiciary Committee for Senate Bill 1206 – Child Abduction Prevention. This is just one of many hearings they have attended to gather support. The Portland consulate violated the policy and provided his ex-wife with the passport for Mochi. Six days later he received a phone call from the police telling him his wife and child were missing. His wife kidnapped their son to Japan. “In that moment, my life was shattered,” Morehouse said. “My days became consumed with dealing with local law enforcement, the U.S. Department of State, Japanese consular officials and anything I could think of to find my little boy. Morehouse, Collins and the other members of BacHome continue to exhaust their resources to locate their children. They recently wrote a letter in advance of Clinton’s July 8 trip to Japan. Urging officials to help return their children, it was addressed to the Prime Minister to the Los Angeles consulate, four other Japanese consulates, members of the media, the Department of State, White House Office staff, all U.S. Senate offices, and members of the House of Representatives. During Clinton’s visit about 40 parents of abducted children in Japan participated in a rally attempting to secure her help in pressuring Japan to address the issue of child custody. Parents will continue to fight and hope that those in charge take notice and urge Japan to return their children. U.S. State Department Cover-up of International Parental Abductions? For over a decade the Department of State has largely ignored the issue of international parental kidnapping. The Department of State suffers from a severe conflict of interest – they view their primary role as maintaining relations with foreign countries, often referring to foreign governments as their “Clients”. By its very nature, the child kidnapping issue is “disruptive” to the relations between the U.S. and countries which support abduction. Through a series of sleights of hand, the State Department actively attempts to downplay, minimize and cover up the number of abductions and the true severity of their failure to address the issue. As an example, for over a year the Department of State has neglected to update the number of children kidnapped to Japan. http://goo.gl/Gxu48 Not to mention that the official count provided by the Department of State is constantly called into question [ http://goo.gl/q234a AND http://goo.gl/YQ4uP ], and that the State Department continues to publicly manipulate the numbers [ http://goo.gl/fMxcI ]. The State Department completely refuses to call out major offense countries, such as Japan, for violating the human rights of US children, attacking U.S. sovereignty, and abdicating their responsibility to the International community. “SEC. 203. INTERPRETATION OF EXTRADITION TREATIES. Since the State Department acknowledges that Japan has arrested parents for “kidnapping”, how can they continue to repeat the farcical claim that such an act is not illegal in Japan?! In addition, Japan ratified the UN CRC in 1994. This UN human rights treaty states in article 11 that international kidnapping (specifically including Parental Kidnapping) is a crime. Further, Japan’s constitution clearly states in article 98 that “the treaties concluded by Japan and established laws of nations shall be faithfully observed” [ http://goo.gl/OeauR ]. So the State Department is choosing the path of least conflict by refusing to call Japan out; and doing so at the expense of U.S. parents and U.S. children. So why is the Department of State violating federal law and continuing to block any attempts at extradition from the country of Japan? Why is the Department of State refusing to publicly condemn these human rights abuses against U.S. citizens and attacks on U.S. sovereignty? These are precisely the type of actions needed to bring this issue of protecting U.S. children to head, and force a resolution between the two countries. The disfunction of foreign courts should not impede attempts to take appropriate legal actions consistant with U.S. federal code that would highlight these issues. Nor should the Department of State cower from its duty to protect U.S. children by publicly calling out countries which are guilty of this human rights offense. Why does the State Department seem to have such woefully misplaced loyalties? And why are they being allowed to violate U.S. Federal Law? And what are the members of Congress going to do about it? Because right now, Congress is sitting on their hands as the Department of State sells out U.S. children.